The next U.S. secretary of defense will affect world affairs in profound ways — the drawdown of troops from Afghanistan in 2013, the use of military drones to launch attacks on Yemen and Pakistan, and the ongoing strategic interest of U.S. armed forces in the Asia/Pacific theater. It wasn’t pre-destined that the nomination of former U.S. senator Chuck Hagel as U.S. defense secretary would come to be defined by U.S.-Israel relations. But Hagel’s nomination has been hit with a wall of criticism against his record as being anti-Israel, and while that makes his confirmation in the U.S. Senate trickier, it’s also given Obama somewhat more power to influence the shape of the next Israeli government. The main charges against Hagel are that he’s not sufficiently pro-Israel, that he’s not sufficiently serious about Iran’s potential nuclear program because of his call for unilateral talks with Iran, and, most recently, that he’s somehow anti-gay because he made some less-than-charitable remarks in 1996 about James Hormel, who was then-U.S. president Bill Clinton’s nominee as ambassador to Luxembourg, even though Hormel has accepted Hagel’s apology and Hagel fully supports openly LGBT servicemembers, and he supported the end of the ‘Don’t Ask, Don’t Tell’ policy in September 2011. The Israel charges, however, will dominate Hagel’s confirmation hearings, which may well coincide with Israel’s upcoming election for the Knesset, its 120-seat unicameral parliament. Although Benjamin Netanyahu’s center-right Likud (הַלִּכּוּד‎, ‘The Consolidation’) is expected to win the largest number of seats, it remains unclear whether his ultimate governing coalition will be more right-wing or more centrist — it’s likely he will have several paths in cobbling together a majority. That’s the key fact of the Jan. 22 election, and that’s what makes the ongoing dynamics of the Hagel nomination so intriguing. Most of the opposition to Hagel so far, I believe, has been largely smoke, not fire. Even writers at Haaretz find it difficult to take the charges too seriously. But senators and former senators are rarely denied confirmation for cabinet offices. The only U.S. cabinet appointee with a Senate background to be rejected as a nominee was John Tower, a former Republican senator denied appointment as George H.W. Bush’s secretary of defense in 1989, essentially on the basis of charges of alcohol abuse (and even that was a narrow vote). Obama’s first choice for secretary of health and human services in 2009, Tom Daschle, a former Democratic senator from South Dakota and Senate majority leader, withdrew his nomination after issues surfaced with respect to problematic tax issues. He is not anti-Israeli and he is not an anti-Semite. In fact, if I were him I would lodge a complaint with the Anti-Defamation League, asking their assistance and support for being unfairly called an anti-Semite. 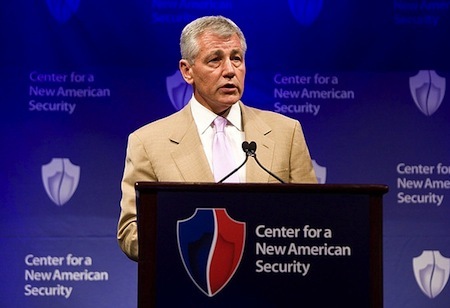 I have met Chuck Hagel three times while he was a US senator. All three meetings were with Ehud Barak, Israel’s current Defense Minister…. Barak was thoroughly impressed not only by Hagel’s military background, but by his analysis, knowledge of the Middle East, and his understanding of Israel’s security issues and predicaments. The two consulted each other quite frequently on the eve of the Iraq war, in late 2002 and early 2003. Maybe, but given the media circus around Hagel’s views on Israel, his nomination may now actually be even more useful in nudging Netanyahu toward building a more centrist coalition in the first place. Michael Koplow at his excellent Ottomans and Zionists blog notes that pressures from Israeli domestic politics favors a right-wing coalition, while international political pressures favor a more centrist coalition. At the outset of Israel’s elections, Netanyahu merged Likud with secular nationalist Yisrael Beiteinu (ישראל ביתנו‎, ‘Israel is Our Home’) of former foreign minister Avigdor Lieberman, and despite some slippage in the polls, the ‘Likud-Beiteinu’ ticket will almost certainly win the largest plurality of seats in the Knesset. In December, however, Lieberman, resigned under the weight of legal problems, and the conservative Bayit Yehudi (הבית היהודי, ‘Jewish Home’) of Naftali Bennett began gaining in the polls. As Koplow notes, the most natural coalition for Netanyahu, in domestic political terms, would be to bring Bennett’s surging Bayit Yehudi into his coalition. But there are any number of reasons why Netanyahu may reject a coalition with Bennett, starting with the horrible international optics of a government that includes both Bennett and Lieberman — a government even more truculent on the Palestinian peace process than the current government. For starters, Bennett, once Netanyahu’s chief of staff, quit Likud in 2008, and so the two do not have the best personal relationship. Within the past 24 hours on the campaign trail, Netanyahu has gone on the offensive against Bennett, while simultaneously indicating he’s willing to bring any number of the main center-left parties into a coalition — including not only Hatnuah (התנועה, ‘The Movement’), a new party formed by former foreign minister Tzipi Livni, but also the reformist / centrist Yesh Atid (יש עתיד, ‘There is a Future’) formed last year or even the center-left Labor (מפלגת העבודה הישראלית), led by Shelly Yacimovich. Given that Israel’s center-left seems hopelessly disunited with just over two weeks until the election, Netanyahu is well placed to peel off the support of one or even two of the center-left parties, thereby allowing him to keep Bennett’s ultraconservatives out of government. Livni would like to return to the foreign portfolio to pursue a Palestinian peace deal, and Yacimovich would like to advance a more progressive economic policy — Netanyahu and his Likud colleagues are opposed to either of those outcomes, so the negotiations would be difficult, though not impossible. While having Hagel at the Pentagon isn’t likely to decide the question, it’s another thumb on the scale. It will certainly be a factor in Netanyahu’s political calculus — although Netanyahu may not care about international sentiment in general, he will certainly care about U.S. sentiment. † For what it’s worth, I also think Obama is effecting something of a political masterstroke in creating a damned-if-you-do-damned-if-you-don’t dilemma for Republicans. If Senate Republicans reject Hagel, Obama will be able to paint Congressional Republicans today as even more radical and neoconservative on foreign policy than they were even during the Bush administration. If Senate Republicans accept Hagel, it will given Obama another high-profile bipartisan appointment and a strong voice in Defense for further cuts that would be difficult for Congressional Republicans, who have spent the past four years howling about federal debt, to reject. It would also validate Hagel’s heresy against George W. Bush — he was an increasingly vocal critic of the war in Iraq and the way in which the Bush administration sidelined Congressional input in waging that war.